Introducing Kids Dream Talls 'N Smalls Animal Friends Plush Teddies. Our best sellers at our recent local event are now discontinued designs so once they are gone you won't be able to purchase them again. These cute and super fluffy animal friends come in pairs so they will never be lonely.. One Tall measuring 33 cm and One Small measuring 22 cm. * Develop Children's awareness of themselves and others. These really are fantastic to develop your children's learning through play and of course not forgetting they are super cute too! Sit back and watch your child play with Talls'N'Smalls ... They really will be their new best friends! Talls 'N Smalls features doll-like animals with long legs and lots of sweet personality. Each features a sculpted face with embroidered detailing, and a belly and back made of super soft textured fabric. 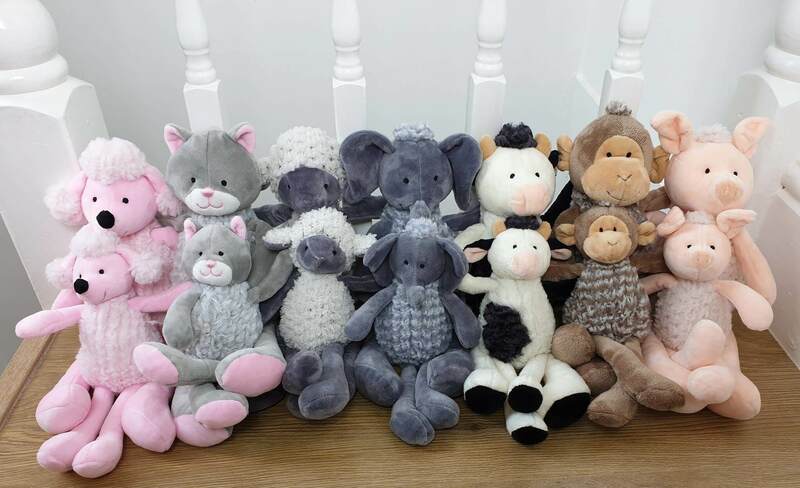 Choose from a variety of animals: cows, elephants, kitties, lambs, pigs, unicorns and poodles. Each comes in 9-inches and 13-inches, they come as a pair. Mary Meyer is an environmentally conscious company and has been making toys that are safe and fun since 1933. Mary Meyer has received numerous awards including multiple Toy of the Year awards. Known for using unique, beautiful, and incredibly soft fabrics, Mary Meyer continually strives to design extraordinary products of outstanding quality, all the while keeping an eye on customer service and value. 1. Design - Exceeding ASTM standards is the mantra of our experienced designers. Getting it safe right from the drawing board is the key. Whether they are specifying how items are sewn or which fabrics and components to use, our designers constantly make decisions that keep our toys among the safest in the industry. 2. Testing - The fabrics and construction of all Mary Meyer toys are fully tested to meet and very often exceed US safety standards. If a toy fails the tests, it is either dropped before production or is redesigned until it passes all safety tests. - All toys go through metal detectors to assure no metal fragments are inside our toys. - All plastic eyes are sonic-welded in place to assure they remain firmly and safely attached to the surrounding fabric. - On most of our toys with "beans" inside, the beans are sewn into inner bean bags. This decreases the chance that individual beans will escape from our toys. 4. Inspection - Ongoing inspections during and after production are an integral part of our safety program. Not only are toys inspected for safety, they are also reviewed for quality control, design consistency, correct labeling, and package integrity. 5. Compliance Certification - Mary Meyer has pdf's of each toy's CPSC Compliance Certificate available to the public as required by law. They can be found on our web site by clicking on the certificates tab and scrolling to the item number desired. The item number immediately follows MM.